Are you searching for the best stainless steel rice cooker to cook your rice? Which part of the cooker do you need to be stainless steel, like the exterior or interior or the whole rice cooker needs to be stainless steel? Most of the companies that make rice makers have it only either on the exterior or interior. What I mean by exterior is the body cover part and by interior the inner part of the rice cooker like the inner pot. If you want to make more healthy cooked rice then you need to choose the one that has the inner pot made with stainless steel. There is a downside of using a stainless steel rice maker to make healthy rice. The downside is the rice can stick and burn on the bottom of the pot. That makes it harder to clean up and the ones that get burned don’t taste that good. I found this out from my own experience by cooking for my parents one week when I was visiting them in the summer. My parents and two sisters have a buffalo brand stainless steel inner pot rice maker. I believe it is the new smart cooker II version. It has quite a lot of functions. If I remember correctly, it can make white and brown rice, porridge, steam, cake, and soup. The price was pretty expensive. I think it was around $150.00 to $200.00, and that’s already including the discount. It does come with a thermos as a gift though. It doesn’t even have an off button to conserve the internal battery which lasts for about 2 years according to the manual. It does have a timer, reheat and quick cook buttons. My mom was having trouble using it. I have spent a few times teaching her how to use those functions. 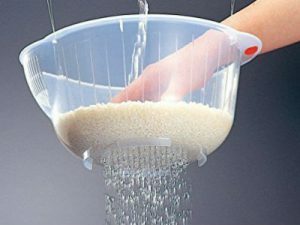 Here is a tip I found through searching online for rice sticking on the pot. Before putting your rice in the pot for cooking, first put a light coating of olive oil inside the pot, that way it might prevent it from sticking. You might also try other kinds of oils if you don’t have olive oil. 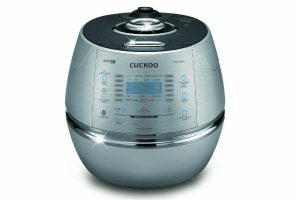 If you really want a real stainless steel rice cooker, you should go for the Cuckoo brand made in Korea. Click here to jump ahead to read a little more about it. What Is So Great About Stainless Steel Rice Cookers? A stainless steel rice cooker makes cooked rice much more healthy for consumption because you wouldn’t be eating those chemicals peeling off from the inner pot. Most of the rice cookers out in the market have a non stick coating on them and they are usually made with enamels and aluminum. If your current rice maker’s pot is peeling or having scratches on its non stick coating, it is a good idea to find a replacement. Who knows what those chemicals will do to our health? It is hard to find a replacement inner pot when most of us have been using the rice maker for many years and the model you are using is most likely discontinued. It looks much easier to buy a whole new rice maker instead. To be honest, I am in the same situation. My current rice maker has scratches and some of the non stick coating is peeling off. It is kind of a waste to replace the whole thing since it still works perfectly fine. I really wish I could just buy a replacement for the inner pot. Too bad I really don’t have a choice because my model has been discontinued by Panasonic. You can either buy another non stick or go with a stainless steel one. At least it is better than using the one that is all scratched or has peeling coating. I am seriously thinking of getting a stainless steel one. If not I will go with the Zojirushi NS-ZCC10 one. 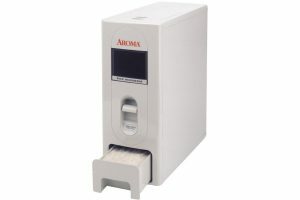 This Aroma rice maker has a model number of ARC-757SG and has a stainless steel inner pot. It is pretty basic to use without a lot of functions but at the same time you can’t use it to cook other things like brown rice, porridge, cake and others. Well I guess you can still use it to cook brown rice, but it is not designed to do that. First, you wouldn’t know how much water and brown rice to put in and your result of the brown rice might NOT be pleasant. So it is not a good idea to use it for brown rice. You can use it to cook up to 14 cups of cooked white rice and that means 7 cups of uncooked white rice. It is less than my rice maker and we have a family of four. It has a cook and automatic keep warm function. It might be possible to use it for steaming, soup, stew and simple oatmeal. It is super simple to use. All you have to do is put in the amount of cups of rice and water level and simply press the cook button and you are good to go. It does come with a measuring cup and a spatula for scooping already cooked rice to eat. The inner pot is removable and dishwasher safe for easy clean up, not to mention it will save you time. This Aroma model is pretty popular among consumers and it has been out on the market for a while now. It’s been out since the year 2012 or it might be earlier. It does receive a pretty good rating by users, and a lot of users have bought this model. To see the actual number who gave it a rating and to read more reviews, you may do so by clicking the above image or the check price button. Pros: It is very easy to use and clean. It has an affordable price. Some of the parts can be replaced, such as the inner pot, measuring cup, and spatula. You can also buy a stainless steel steamer for this cooker if you like to steam healthy fish and vegetables without having to cook separately. Click here to check out the steamer. Cons: Some are complaining the venting hole on the glass lid or cover can spout out hot water and the rice will also burn on the bottom. Some of the users are saying you can use a light cloth to wrap around it or use a bowl to cover the venting hole when it is cooking if that happens to you. If the rice burns on the bottom, try unplugging the cord when the rice is done. Having a timer for your appliances is a very nifty feature. You can preset it at a later time or certain time to cook your food when you are not available to make the meals. For example, you like eating brown rice for dinner around 6:00 PM, but it takes a very long time to cook it and you have to pick up your kids from school and need to go buy some groceries at the store around 3:00 PM. Then you can just preset the timer to start cooking your brown rice at 3:30 to 4:00 PM. Your brown rice should be ready by dinner time at 6 PM. That way you don’t have to wait until you get back from picking up your kids and buying groceries to start cooking your brown rice. You can just start on cooking your other dishes for the meal instead. Cooking brown rice usually takes 1 hour and 25 minutes to 2 hours time to finish, and that also depends on your rice cooker. The below two appliances have the timer feature. It will be very handy for some of you who have a very busy schedule. This gadget called the Instant Pot has multiple functions. 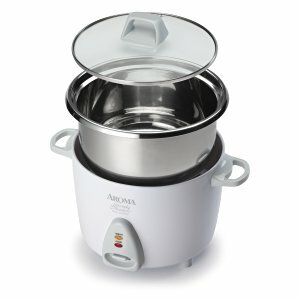 It is more of a pressure cooker but can also be used as a rice cooker. 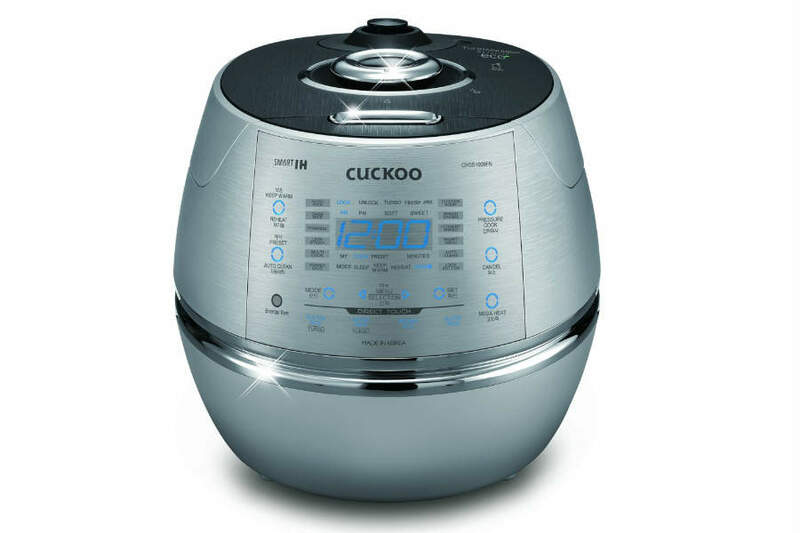 Many users have very good results using this as a rice cooker to replace their current rice maker appliance. This cooker has the following functions: Soup, Poultry, Meat/Stew, Bean/Chili, Sauté, Steam, Rice, Slow Cook, Porridge, Multigrain, Keep-Warm, Yogurt, Pressure, and of course has a delay timer. Please be advised if you are using the delay timer to cook rice, the result of the rice might not be good because if you let the rice soak too long in the water, the cooked rice might come out with an overly soft texture. You can delay the timer up to 24 hours and the automatic keep warm is 10 hours for this appliance. If you leave it on the keep warm mode too long, the bottom layer of the rice might burn. After all, the inner pot is made with stainless steel. It is not this cooker causing the rice to have soft texture. It is the amount of time you left it in the water soaking. Any kind of pot or bowl will do that. You can get this cooker in 5, 6 and 8 quarts in sizes. They pretty much have all the same features other than they are different in dimensions and weight. This gadget is a pressure cooker, so it is supposed to help you reduce cooking time up to 70%. If you like you can read my full review for the Instant Pot IP-DUO60 by clicking its hyper link. If you want to know the current price, you may do so by clicking the “check price” button. This is my favorite and number one choice of a stainless steel rice maker. The whole thing is pretty much made with stainless steel. That means the body and inner pot are made with stainless steel. The interior cover and lid is also made with that. It has about 19 cooking settings. If you ask me that is way a lot more than other cookers I have come across. It has a very sleek look and can cook up to 10 cups of uncooked rice. This item weighs about 18 pounds with 21 safety features. This cooker is more for a high class family because the price to get one is pretty steep, and I am no where near high class enough. Wish I will be one someday and soon. Now I am becoming cuckoo just like this brand name. LOL…….. If I want this item I would have to save up a lot and sacrifice a lot of other items for a very long time to be able to buy it. If you don’t believe me then you can click on the check price button to check the current price. It does seem like it’s made with very high quality materials. My favorite feature from this item is the voice navigation. Yeah, sometimes I’m feeling lazy with my hands so prefer to navigate the menus with my voice. The navigation has three available languages and they are English, Chinese and Korean. It is kind of cool I can use two of these languages. Click the following hyper link to read more of my extensive review for the Cuckoo CRP-CHSS1009FN.